This tour will take you to a centenary winery where we will taste its wines. 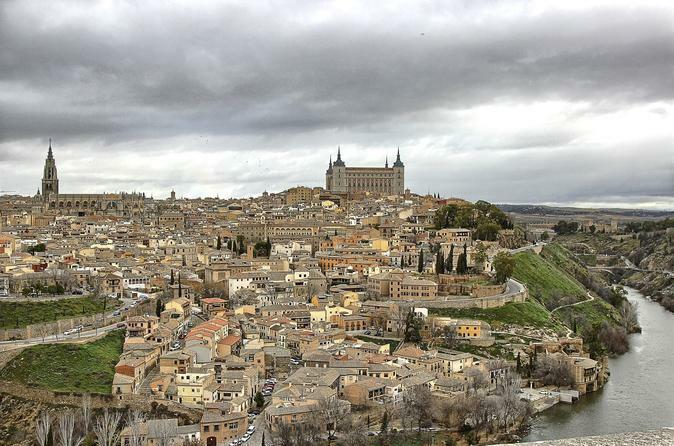 Then, Toledo, a panoramic tour of the city will show you one of prettiest cities in Spain then, you will have free time to have lunch or you can join our guide for a tapas tour where you will enjoy 3 traditional bars or taverns (food and drinks are not included but their approximate cost is about 25 euros per person). Finally, to immerse yourself in the medieval Toledo an official guide will explain two of the most important monuments of this city: The Cathedral and Santa María La Blanca Synagogue (tickets included).This tour combines the introduction to the wines in a centenary winery with the historical city of Toledo where everything is represented: culture, gastronomy, art and tradition at a dramatic location. We will meet you 5/10 minutes before the departure time at the meeting point. There you will meet the guide and your tour companions with whom share the Toledo tour. We will get on the minivan or bus and we will go to the Centenary winery while the guide introduce you on the history of the region. While the travel you can enjoy the landscapes. Probably the oldest winery in the region will be the first stop (approx 200 years producing wine). There we will meet the owners and the guide will inform us about everything we need to know. We will taste several wines and some snack. The guide and the winemakers will instruct us about the wine process while we taste more wines. It will be a full visit to the winery so you can see how the wine is made. After the centenary winery visit, we will go to Toledo. We will start with a panoramic visit of Toledo so you can appreciate this magnificent and beautiful city with a full-scale perspective. After lunch, you will have free time, so you can do some shopping (for example in its multiple little stores all kind of “Spanish artesanía” hand crafted items) or a nice walk around this magical city. Our guide can recommend where to go or what to do if you need it. Toledo immersion with an official guide of Heritage of the city. Our group will meet with an official Toledo guide who will show us in depth probably the two most important monument of the city. The cathedral and the Synagogue. (Tickets included). The official guide will provide reliable and curious information about the history of the places visited and the city. Just relax and enjoy the return. The arrival will take place around 18:00 approximately. The Toledo Wine Tour ends at the same point where it starts.